Powerhouse 30 Year Celebration Breakfast Cookies for Bill! 1. 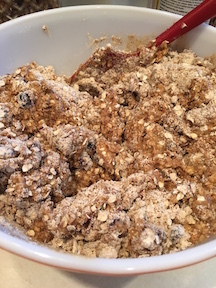 Mix all dry ingredients in a large bowl. Add spices and set aside. 2. Whip egg whites in a medium-sized bowl. 4. Add vanilla and Nut milk. 5. Using a hand wisk whip up until frothy. 6. Pour wet ingredients over dry, folding together with a spatula until blended. Drop by spoonfuls (about 2 TLBS) onto a nonstick cookie sheet about 2 inches apart. If your cookie sheets tend to ‘stick’, use parchment paper. 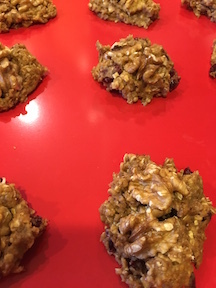 Top each cookie with a few walnut pieces or dark chocolate chips. PRESS the walnuts in firmly! 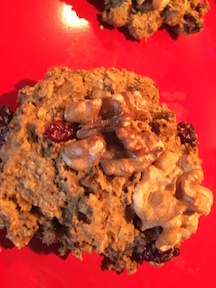 NOTE: I shaped my cookies to the desired depth and circumference when I put the walnuts on top and I'm glad I did – these cookies do not melt down! I also baked two sheets at a time....Every oven is different so start checking them at about 17 minutes. 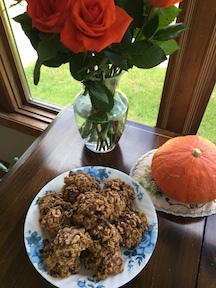 These delicious cookies are perfect for Shabbat mornings or whenever you want to have something a little special with your morning java! Makes about 40 Large Cookies!